Where did God come from? What do the bible stories really tell us? Who or what was Jesus Christ? This book challenges everything we think we know about the nature of religion -- The ancient fertility cult at the heart of Christianity -- The living power of cultic rites and symbols -- The sacred mushroom as the emblem and embodiment of divinity -- The secret meaning of biblical myths -- The language of religion that links us to our ancestors. 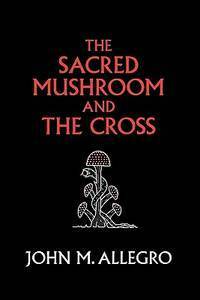 The Sacred Mushroom and the Cross sets out John Allegro's questthrough a family tree of languages to find the truth about where Christianity came from. Bantam Books, 1971-01-01. Paperback. Used:Good. Bantam Books. Used - Good. Ships from the UK. Shows some signs of wear, and may have some markings on the inside. 100% Money Back Guarantee. Your purchase also supports literacy charities. 2009-03-03. New. Ships with Tracking Number! INTERNATIONAL WORLDWIDE Shipping available. Buy with confidence, excellent customer service! Bantam Books, 1971-01-01. Mass Market Paperback. Acceptable. Bantam edition, mass market paperback, June 1971. Spine tending to open at the same place (beginning of weakening); generally mild wear. Edges gently tanning. No markings noted. London: Hodder and Stoughton, 1970. A study of the nature and origins of Christianity within the fertility cults of the ancient Near East. 349 pages in very good, clean condition. Two colour plates and six figures. Clean brown endpapers with mushroom illustrations. Black cloth with gilt titles on the spine. Corners not bumped. Black DJ with illustration and orange titles. Corners and edges are worn and scuffed. NEAR FINE/GOOD+. 2nd Impression. Hard Cover. Near Fine/Good+. Garden City: Doubleday, 1970. First American edition. Hardcover. Fine/near fine. 2009-03-03. Good. Ships with Tracking Number! INTERNATIONAL WORLDWIDE Shipping available. May not contain Access Codes or Supplements. May be ex-library. Shipping & Handling by region. Buy with confidence, excellent customer service! Bantam. MASS MARKET PAPERBACK. B000KWAESG 2nd printing, Good. Light to moderate shelf wear to covers/corners; satisfaction guaranteed. Mass market paperback binding. Earthlight Books is a family owned and operated, independent bookstore serving Walla Walla, Washington since 1973. . Good. Gnostic Media Research & Publishing. PAPERBACK. 0982556276 New Condition. . New. Gnostic Media Research & Publishing. PAPERBACK. 0982556276 Like New Condition. . Fine. London: Hodder, 1970 DW minor edge wear, small tear top edge, xxii 349pp + plates, theory by one of the original researchers on the Dead Sea Scrolls that christianity is in fact based on an Ancient middle eastern mushroom cult, author is (was?) a well respected scholar and specialist in the field of semitic religions and languages. First Edition. Hard Cover. Very Good/Very Good. 8vo - over 7? - 9? tall. London: Abacus, 1973 253pp. Spine is heavily rubbed. Spine ends are chipping and have small tears. Front wrap has a reading crease. Top edge of front wrap has a triangular surface tear. Tips are bumped, causing creases. Edges of wraps have creases. Top edge of rear wrap have a few light bumps and a couple of surface tears. Edges of rear wrap are sunned. Wraps have soiling and light scratches. Edges of text block are dust stained and have light foxing. Former owner name and date on "about the author" page. Marginalia and some underlining throughout, primarily in pencil. 0349100659. Revised. Paperback. Fair. The Sacred Mushroom and the Cross: A study of Nature and Origins of Christianity Within the Fertility Cults of the Ancient Near East . Gnostic Media, 2009. Very good clean tight copy. 40th Anniversary edition. Text free of marks. Professional book dealer since 1999. All orders are processed promptly and carefully packaged.. Hard Cover. Very Good/Very Good. Gnostic Media Research & Publishing. PAPERBACK. 0982556276 Special order direct from the distributor . New.